BIOGRAPHY OF SAINT JOHN OF THE "LADDER OF DIVINE ASCENT"
The origins of this super-luminary of the Church are forever shrouded in mystery because of our Holy Father's complete renunciation of the world. However, we do know that Saint John was born in the second half of the 6th century. 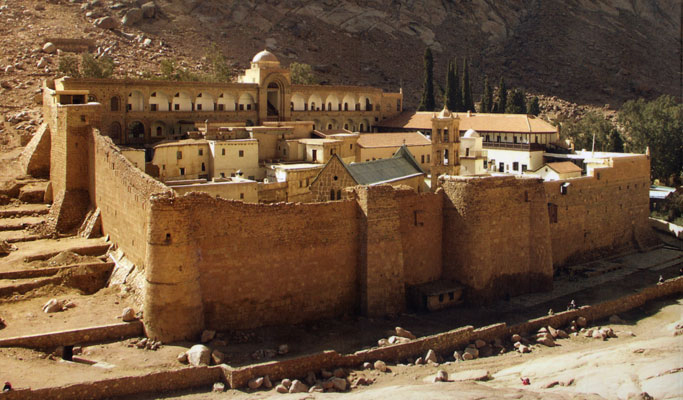 The future Abbot of Sinai entered the monastery of his repentance at the age of sixteen, offering himself as a well-pleasing sacrifice to Christ our God. From the beginning he began conquering the passions and avoided the traps of the evil one through his extreme humility and total obedience to his spiritual father, Abba Martyrius. But his Elder did not tonsure him until he reached the age of twenty, after testing his humility as a novice for four years. On the day of his tonsure Abba Strategius predicted that John would “become one of the great lights of the world.” Later Martyrius took his disciple and visited Abba John the Sabaite, a famous ascetic, who ignored Elder Martyrius and poured water on his disciple's feet. After their visit Abba John prophesied that the young disciple would be the future Abbot of Sinai. Abba Anastasius the Sinaite also repeated this prophecy. The disciple John passed the next nineteen years in the “blessed freedom” that total obedience brings. Following the repose of his tutor in Christ, he entered the “arena of solitude” by retreating to Tholas, a solitary place near the monastery church, where other hermits lived. Again, he did not do this under his own volition but on the recommendation of the holy Elder George Arsilaites, who instructed him in the hesychastic way. Thus, remaining under obedience, he continued his divine ascent, step by step, for the next forty years, continually subduing his passions and attaining the heavenly virtues. John struggled to keep his virtues hidden, but when God judged that the time had come for him to edify others, he took in disciples. Like “a second Moses” he came out of the desert when the Lord later charged him to become the head of the “new Israel” which was the Monastery founded by the Emperor Justinian in 548, at the foot of Mt Sinai. On the day of his enthronement as the Abbot, with 600 pilgrims attending, the Prophet Moses was seen delegating instructions to the stewards. Later, Abba John, the Abbot of Raithou, having heard of the exemplary life of the monks of Sinai, entreated Saint John to explain how those struggling in the angelic life may be saved. St John wrote his treatise of thirty homilies in the form of a “Ladder” of thirty steps, on how one can progress from virtue to virtue. 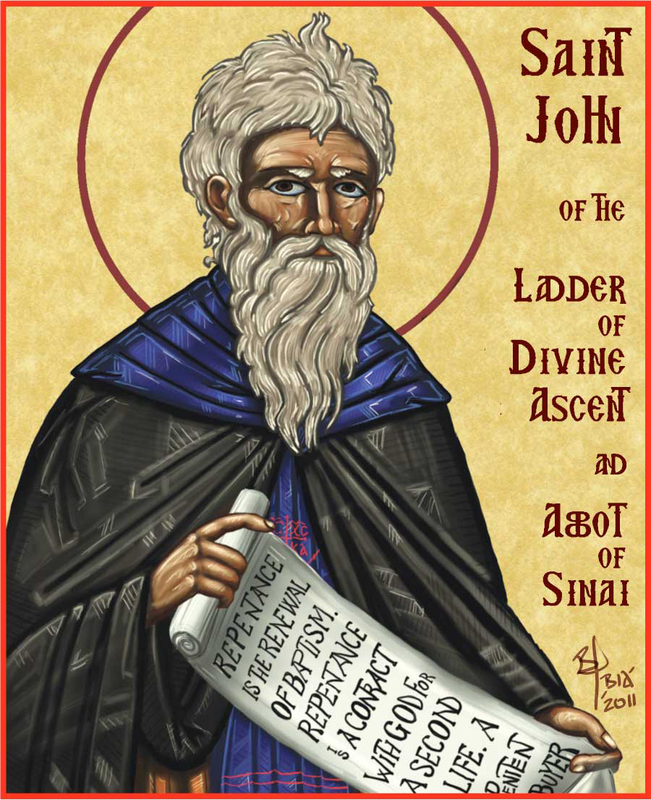 This “Ladder of Divine Ascent,” for which St John is surnamed, has become the preeminent guide in the evangelical life, for both Orthodox laymen and monastics, putting the Gospel into practice. After having climbed this lofty ladder, and having reached the Heavens, St John reposed in the Lord at the age of eighty. Like that lofty ladder which Jacob saw * reaching to the Heavens, * even so, by thy godly words, * thou hast raised a ladder * that bringeth all the faithful * unto the heights of virtue, * O blessed Father John. The ancient and Holy Greek Orthodox Monastery of Saint Katherine, Sinai, Egypt.